A modern minimalist high gloss white vanity unit with a back to wall WC unit is perfect for any bathroom. The Minimalist High Gloss White Vanity Unit comes with dual flush concealed WC cistern and a white gloss toilet pan with a toilet seat. The WC unit has a removable front panel which can be drilled for right/left hand or front flush. All white gloss vanity units feature a high quality 1 tap hole ceramic basin. Comes with 5 year guarantee. Please note, bathroom suite comes as 2 separate units. 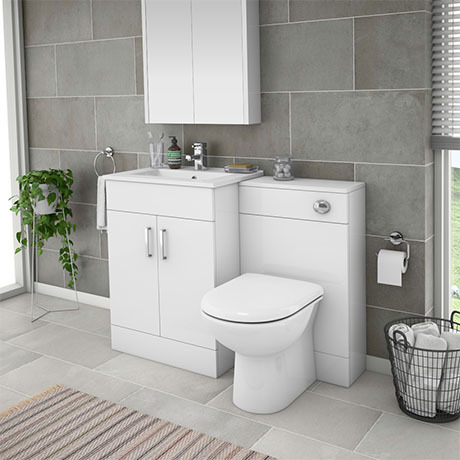 The Turin white vanity unit bathroom suite is ideal for creating a range of styles in the bathroom, as it comes with three choices of toilet pans. It is perfect for creating a clean and contemporary environment. Ideal solution to utilizing space in the bathroom as it incorporates storage, a wash basin and a toilet in one simple yet stylish unit. For use with our back to wall toilets and vanity WC units. Modern minimalist back to wall Toilet pan. The back to wall pan only projects from the wall by 48cm. Top-fixing Quick Release Toilet Seat. Hi Carol, the unit has a depth of 200 so if the pan is 480 the total depth would be 680mm. I hope this helps, please let me know if you have any further questions. Q. Is the toilet included in this package ? Yes, the Modena High Gloss White Vanity Unit Bathroom Suite includes the toilet. Thanks. Q. Would you tell me how thick the MDF is the units are constructed of? Hi Ian, these vanity units are approximately 2 cm thick. Thanks! Q. Would I normally rely on the person fitting it to supply the 'waste' bits? Yes. As there are many configurations of waste outlets, the fitter/plumber would normally supply the correct pan connector, waste pipe etc. Q. Is the basin vanity unit seperately available? Yes. Enter "VTMW600" into the search bar for the vanity unit on its own. The measurements depend on which toilet is chosen, I would suggest to call us on 0800 862 0878 and we will be able to help you further with this. Very good service fast delivery. We recently renovated our old bathroom and with this vanity unit in place it looks now looks very stylish. Great quality and price. Delivered on time. "This unit looks so nice, and such a great price, delivered when we requested, well packaged." Bought this unit in the sale together with the Series 600 BTW pan, the quality and look of the suite is fabulous looks way more expensive than it was. Delivery was great all parts delivered on time nothing missing or broken. I would highly recommend Victorian Pluming to all friends and family. Bought this in the sale. Delighted with quality and look for the sale price. Delivered head of schedule. Would definitely use Victorian Plumbing again!